What a treat to join 7 others on a tour of some of the gardens and private homes of the Cotswolds. They have a charity program called the National Garden Scheme where gardens all over the country are open, with all income donated to charity. Generally these are private gardens and this is the only time they are open. After arriving in London we took off for the countryside. I had been in a little bit of that area about 35 years ago but had forgotten how beautiful and rural it is. Most of the area is protected from too much development and most buildings are built from Cotswold stone. It’s a honey colored limestone that gets a rich color as it is exposed to the weather. The first garden we visited was in the town of Blockley, where Father Brown Series is filmed. In fact his church was visible from the garden – Mill Dene – as it was just down the hill from the church. This garden is built on a very steep slope and includes a waterfall and a millpond. One of the larger Cotswold villages and largely unspoilt, midway between Moreton-in-Marsh and Chipping Campden, Blockley was a main centre of the silk industry in the 18th and 19th centuries. Of course none of my photos do ANY of the gardens justice. Chipping Campden is a small market town with a beautiful High Street dating from the 14th to 17th century. A High Street is the primary business street in an English town. St James, one of the finest “Wool” churches in the Cotswolds. A wool church is one that was built in mediaeval times with money made from the wool trade. This was an amazing trip, sometimes visiting 3 gardens a day! Hidcote Manor was owned by Bradenstoke Priory in Wiltshire until the Priory was disbanded by Henry VIII in around 1539. The manor house, was built in the 17th century as a farmhouse. It is considered to be one of the masterpiece gardens in England. It was started in 1907 by Lawrence Johnston. Johnston’s garden design with themed “outdoor rooms” revolutionized garden design throughout England,.. and still influences designers today. Over the years many plants have been named after Johnston or Hidcote in recognition of his extraordinary talent and plantsmanship. 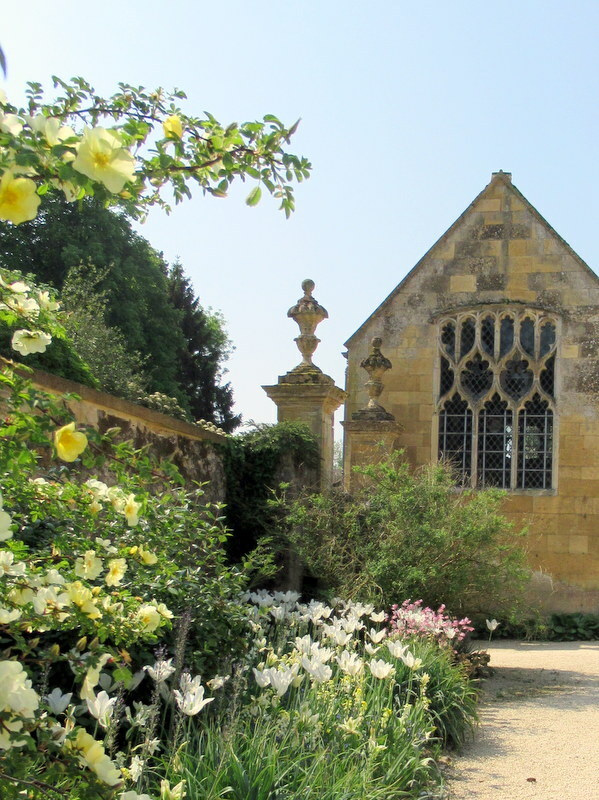 Next was Kiftsgate Court Gardens… where three generations of women in one family created and shaped a garden to be one of the Cotswold’s most treasured. Kiftsgate gardens began in the 1920s by Heather Muir who had an organic approach, with a feminine feel, to gardening. We visited Blenheim Palace a grand country house built in the early 1700s. It is one of England’s largest houses. Blenheim is the birthplace and ancestral home of Sir Winston Churchill. The palace is the current home to The 12th Duke and Duchess of Marlborough. I had been there about 35 years ago and didn’t take a lot of photos of the gardens. And we couldn’t take any inside. It was interesting that they were setting up to film a new Doctor Doolittle film. Sezincote was the most unusual estate we visited. Built in 1805 it was enchanting! A pretty nice place to keep your farm equipment. We were not allowed to take photos inside but here is a photo from their website. Again this photo does not do this room justice it was totally filled with light and looked out over the orangarie. I could have lived in this room. This is the view out the window. Next post – more gardens – the Chelsea Flower Show, and a little bit of London.